To study the feasibility and reliability of the superior gluteal artery perforator (SGAP) flap for the reconstruction of sacral pressure ulcers. A prospective study was conducted between 2009 and 2012 where a total of 15 patients with sacral pressure ulcers underwent reconstructive surgery with an islanded pedicled SGAP flap. 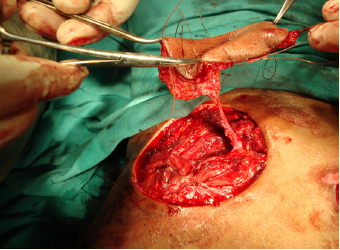 Success of the flap reconstruction and primary healing were defined as a healed wound within 30 days of the procedure. Reconstructive failure was defined as those cases that resulted in a non-healed wound, thereafter. Of the 15 patients in the evaluation, 12 were male and 3 were female. Eleven patients were paraplegic, 3 were ambulatory and one was quadriplegic. All reconstructed flaps survived completely with no mortality or major donor site complications. Three patients had a minor infection and wound dehiscence that healed spontaneously. All wounds healed within 30 days of surgery following local wound care and culture-sensitive antibiotics. No recurrence of the pressure ulcer occurred during follow-up. The non-paraplegic patients did not develop gait disturbances following the surgery. These observations suggest that the islanded pedicled SGAP fasciocutaneous flap is a relatively easy flap to raise, with good reliability and minimal complications, and is therefore highly recommended for the reconstruction of the sacral pressure ulcer.